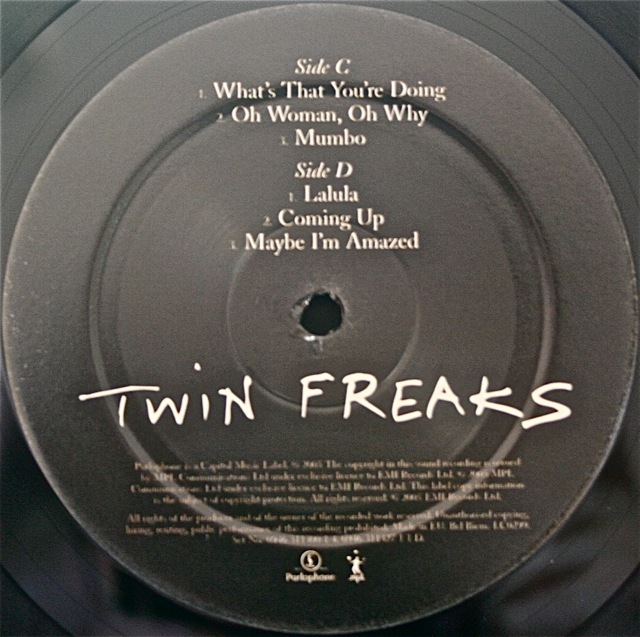 The front and rear covers (above) of “Twin Freaks”. 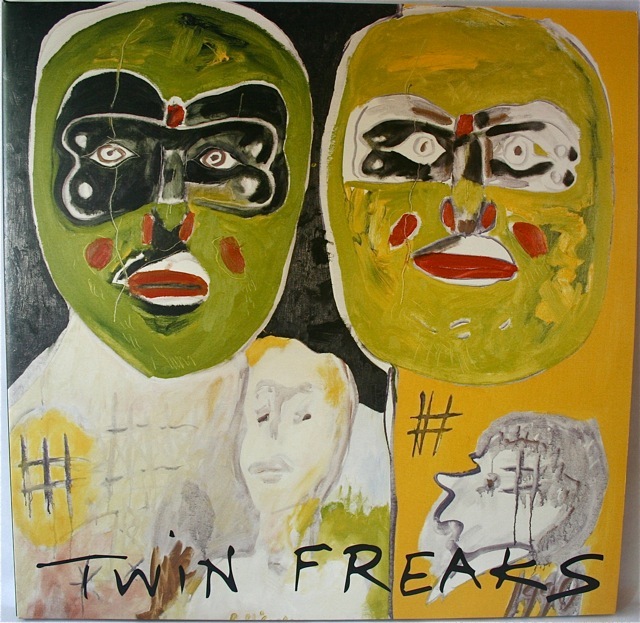 The cover image is a painting actually called “Twin Freaks” which is featured on page 69 of Paul’s book of his artworks entitled “Paintings“. 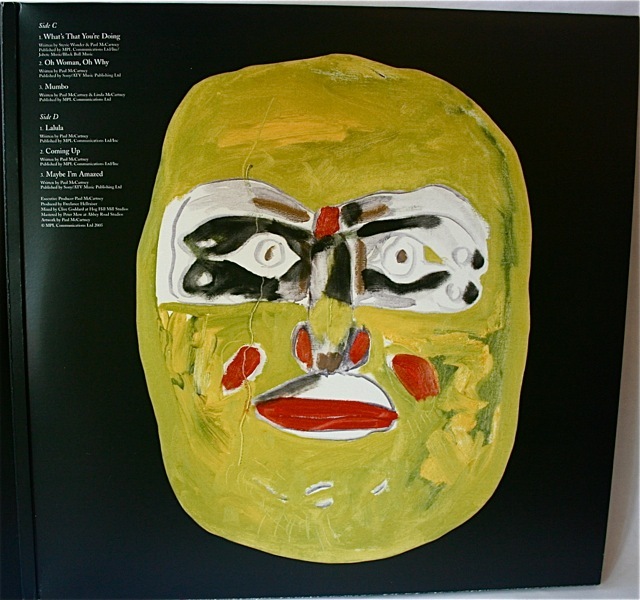 Back in June, 2005 one of the increasingly frequent experimental releases by Paul McCartney, using a nom de plume like his Fireman records, came out. 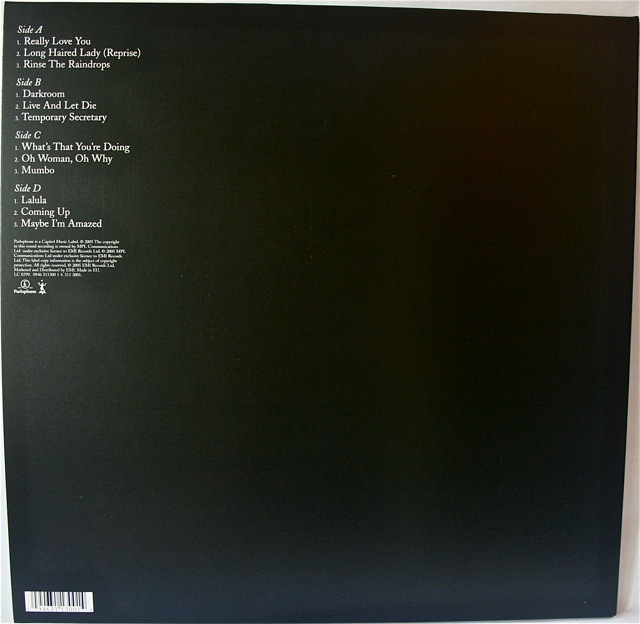 It was a 2 LP, vinyl-only release of twelve remixed McCartney tracks by British DJ and producer Freelance Hellraiser (a.k.a. Roy Kerr). The Wikipedia entry for the disc sums it up pretty well saying McCartney and Kerr “….created the double vinyl album as a continuation of Kerr’s collaboration with McCartney from a 2004 tour. Kerr had previously released the mash-up album “A Stroke of Genius” in 2002. 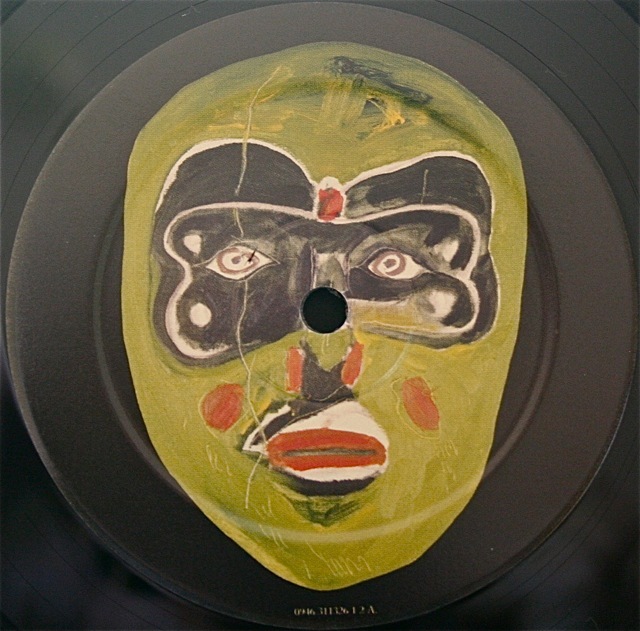 The format of the mashup is that of an extreme remix in which two disparate musical and recording experiences are combined in a manner that goes beyond remix to literally merge or mashup the two songs so that they emerge as something unique or hybridized. The technique sometimes obscures the original source material or so seamlessly blends the divergent elements that disentangling the grafted parts becomes nearly impossible. Kerr performed a half-hour set prior to McCartney’s 2004 gigs in which the DJ remixed various McCartney solo tracks into some unusual and often unrecognizable forms. “Twin Freaks” was the outgrowth of these manipulations. All the McCartney tracks are revised and reinvented in the process. Who is responsible for what aspects of the works or their reinvention is unclear. 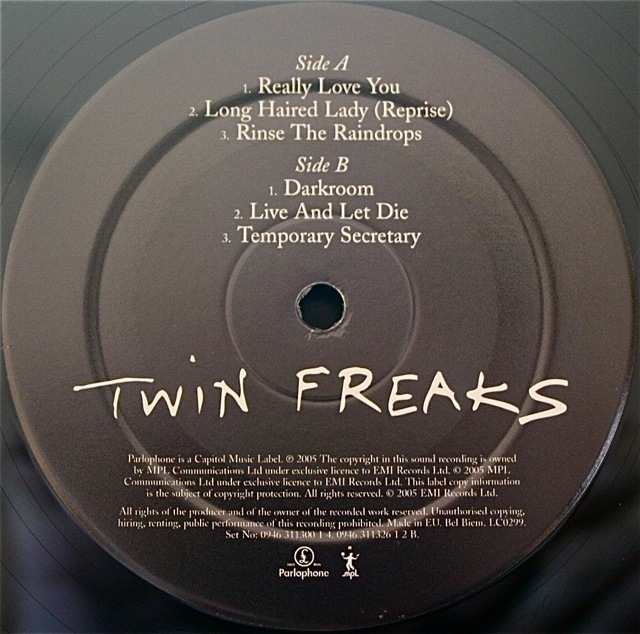 Did the “Twin Freaks” LP ever come out on CD? You see them occasionally on Ebay, but I don’t think this one was ever officially released by McCartney. Please let me know if this is wrong. 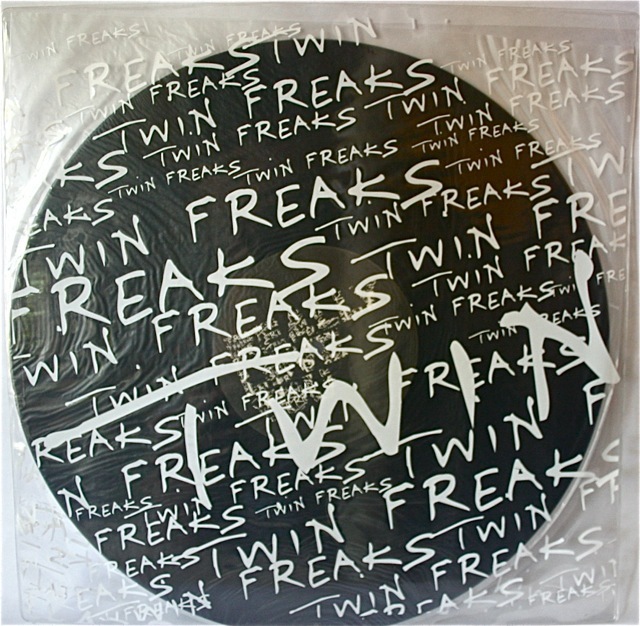 The TWIN FREAKS eponymous debut album is released through Parlophone Records on the 13th of June. TWIN FREAKS is a collection of some of Paul McCartney’s best-loved classics alongside some hidden gems from music’s most envied back catalogue. 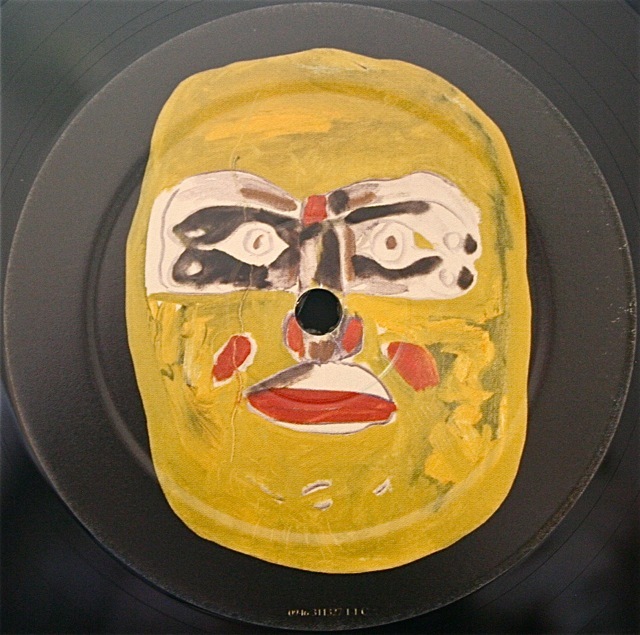 TWIN FREAKS features the studio wizardry of DJ and producer The Freelance Hellraiser, best known for his unforgettable mash-up the 2002 bootleg ‘A Stroke Of Genius’. Hellraiser has since become one of the most sought after remixers and last year he came to the attention of music legend Paul McCartney. In the summer of 2004 The Freelance Hellraiser joined Paul McCartney’s 13 date European stadium tour, opening each show with a twenty-five minute set of remixed McCartney tunes, which culminated in the famous headline performance at Glastonbury. 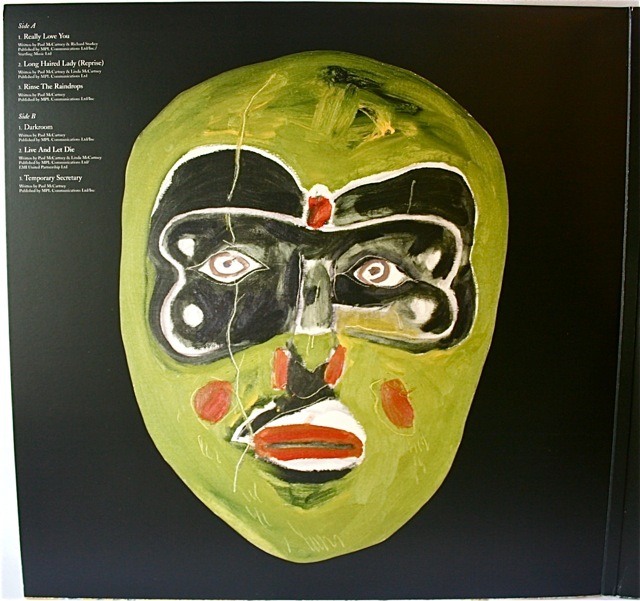 At the time The Freelance Hellraiser said, “There is such an amazing album to be made of some of Paul’s unknown tracks from the late Seventies and early Eighties. He was doing some utterly cool stuff then that the young audience would lap up now”. 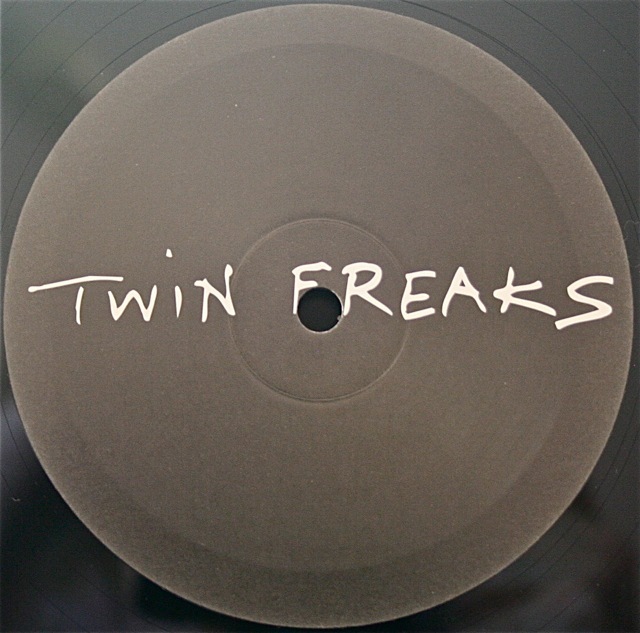 Causing quite a stir on the underground club scene throughout the UK TWIN FREAKS has already received airplay on Radio One’s prestigious show The Blue Room as well as support from Zane Low, Annie Mac, Huw Stephens and XFM. The album is packed with dance-floor epics that span Paul McCartney’s illustrious career. From his solo debut album McCartney (“Maybe I’m Amazed”) through to 2003’s Driving Rain (“Rinse The Raindrops”) and including electro-pop rediscovered classics such as “Temporary Secretary” from 1980’s Coming Up album. 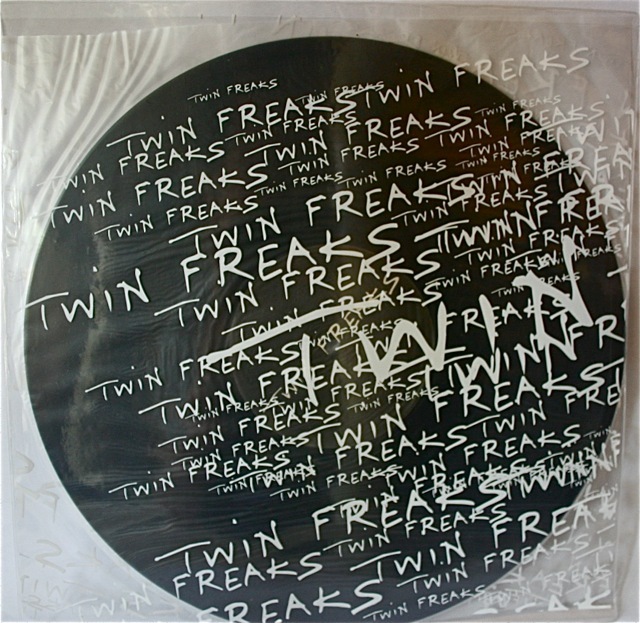 TWIN FREAKS is an alternative take on the greatest back catalogue in music. 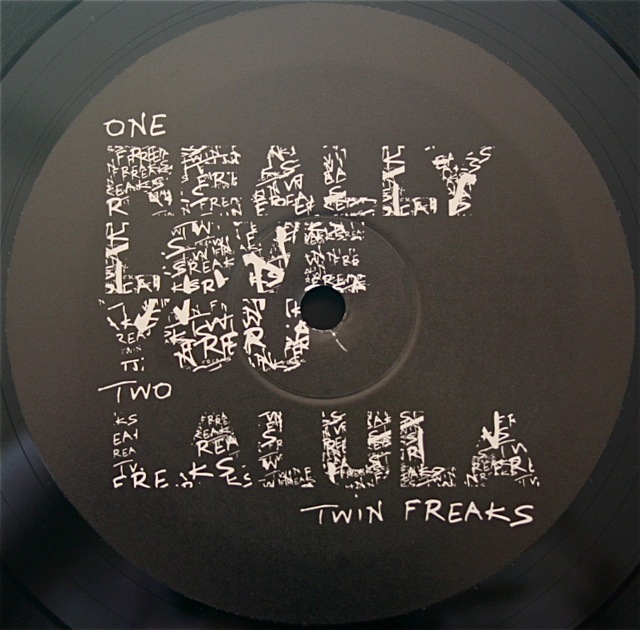 6th of June sees the release of the debut single ‘Really Love You’ from TWIN FREAKS on the new underground label Graze Records. 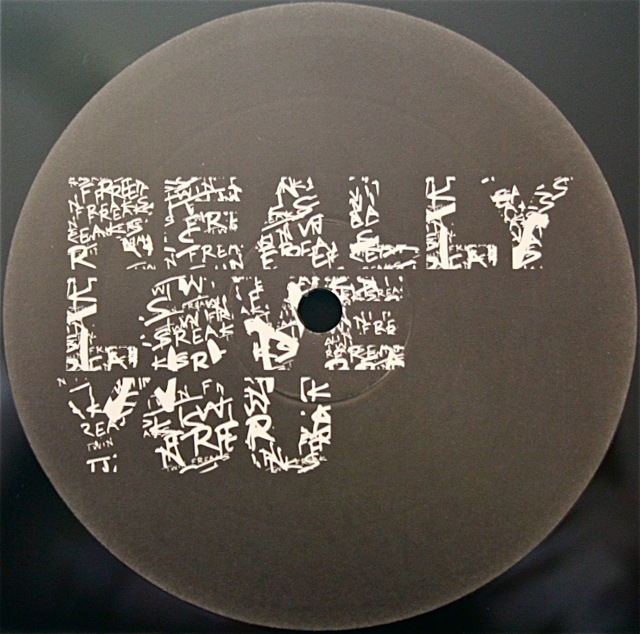 ‘Really Love You’, a twelve inch only release, is the debut from TWIN FREAKS, featuring the studio wizardry of London based DJ and Producer The Freelance Hellraiser AKA Roy Kerr. Best known for his unforgettable mash-up the 2002 bootleg ‘A Stroke Of Genius’. Hellraiser has since become one of the country’s most sought after remixers and last year caught the eye of music legend Paul McCartney. In the summer of 2004 Hellraiser toured Europe with Paul McCartney, opening each show with a twenty-five minute set of remixed McCartney tunes, which culminated in the famous headline performance at Glastonbury. ‘Really Love You’ is a remix of the original track taken from Paul McCartney’s 1997 hit album Flaming Pie. TWIN FREAKS are set to take this McCartney classic to a new audience in clubs across the country this summer. 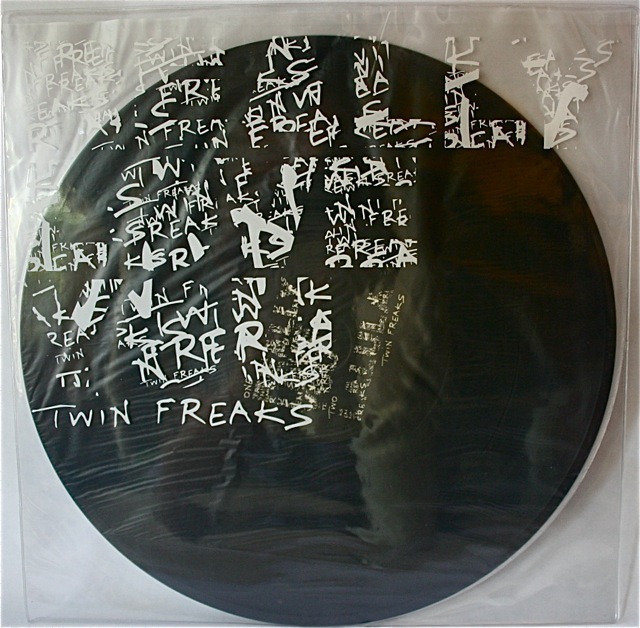 TWIN FREAKS are in the process of putting the finishing touches to their first full album to be released later in the year. ‘Really Love You’ and ‘Lallula’ are just a taste of what’s to come. This entry was posted in Beatles, Beatles Collecting, Beatles Related, Freelance Hellraiser, Paul McCartney, Twin Freaks and tagged Beatles, Beatles Collecting, Beatles Related, Freelance Hellraiser, Paul McCartney, Rare Beatles, Twin Freaks by beatlesblogger. Bookmark the permalink. 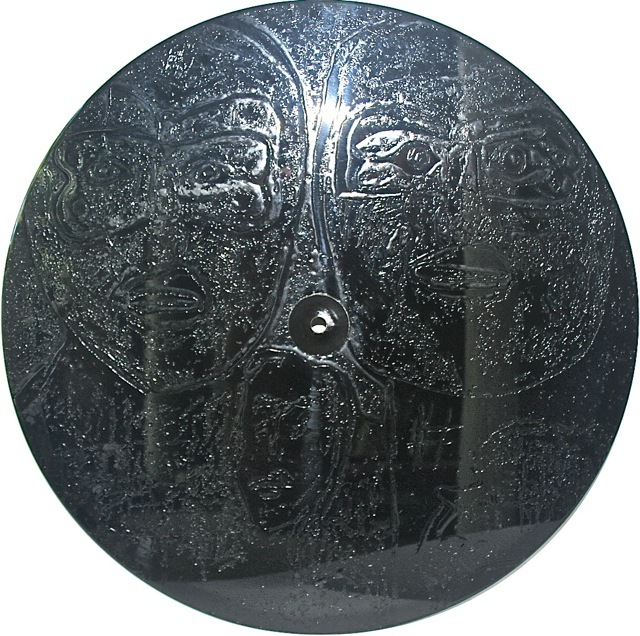 I can confirm the existence of the third 12 inch with Whats That Youre Doing and Rinse the Raindrops , GRAZE011 limited to 200 copies. There is a promo CD of the album each one numbered and named, but you are correct that no official CD has ever gone out anywhere. Wow. Limited to 200 copies……no wonder you never see them around anymore – though I’ll keep looking! Thank you for that information. I knew I’d seen this disc somewhere. And thanks for the info on the promo CD of the album – interesting, too. Apparently Amazon is selling this, as an MP3 album, for only $9.49 in the US stores. Anyone know if this is the complete album? Hey, also just found out iTunes is selling the album, too, but each track has (2004 Summer Tour Remix) at the end of each title; anyone know if these are different from the originals? Thanks!